I started writing this post – and two lines on, my computer shut off. Automatically. I did all the things I knew to diagnose the issue, but had to call my techie in the end, who discovered that the power supply was faulty. Not an original. So I ended up replacing it. Lucky it is not an expensive part. Still, the message is clear. Registration – Vineet Rajan was at the entrance, warmly welcoming everyone while another team member ushered us to the registration table. As each one of us registered, the screen updated itself on stage to show who walked in. I meandered over to where Rachna, Anamika and Indrani were seated. Farida was at the adjoining table. 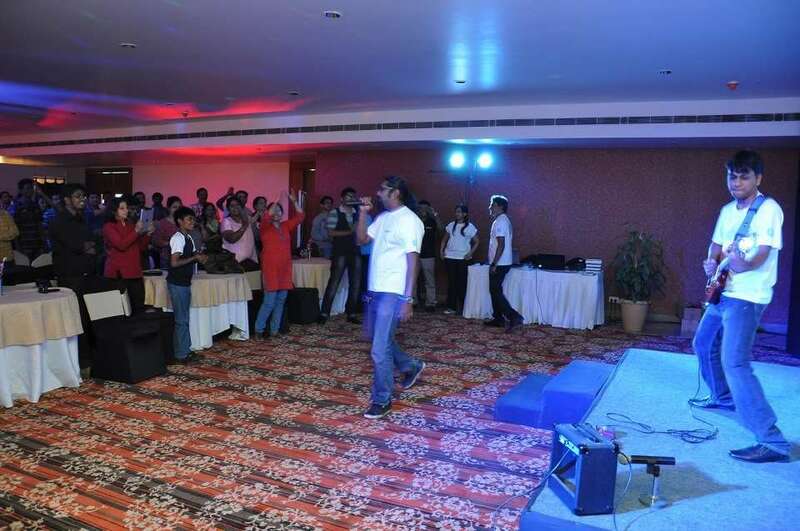 Anoop kicked off the meet in his inimitable and witty style, getting our adrenalin pumping with the IndiBlogger “dance”. My arms remembered this the next day! Listening to the guitar riff of Smoke on the Water by Deep Purple, by Karun Verghese – with Nihaal stepping in with the vocals and inviting everyone to join in on the chorus and headbang with him…set the tone for the rest of the afternoon. I swear I felt like taking my hair crunchie off and letting it all fly! Kidding! Loved it, though! Note to self: Every time I hear this song, I am going to think of this Indiblogger meet! We settled down to a great time with games, smart-alecky answers, interaction and laughter punctuated at very very regular intervals with prizes. 30 seconds of fame – My name came up – and I did a somewhat pathetic Hema-Malini pretend – we do this all the time at home, yet I was stuck for something sensible to say. In any case, I was awarded an 8 GB mini pen drive. Ahem! Surely I am better at being an original! Matching three-part quotes by scanning QR codes – and finding the two other bloggers who had the remaining two parts. I had forgotten my smart phone at home and thanks to Rayyan’s help, deciphered my QR code’s message. Yep, Joel , Tejas and I found each other and were the third to check in with Renie Ravin with our complete quote! We got a book in appreciation. 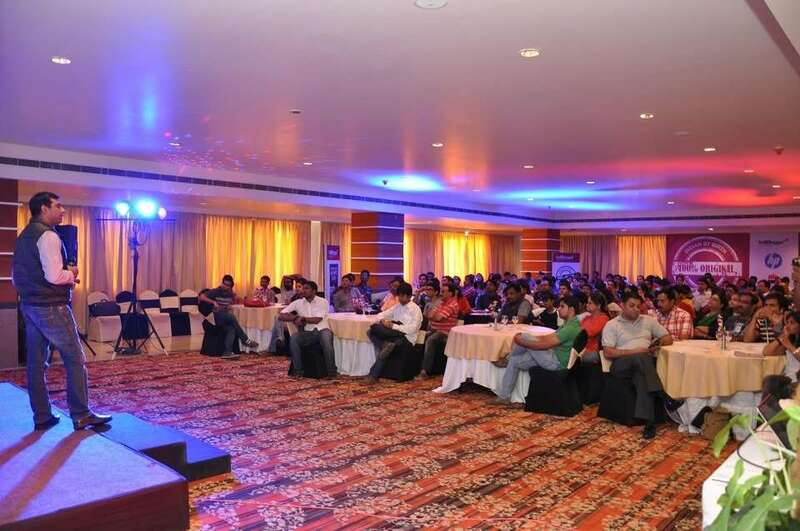 #OriginalCopy talk by HP’s representative – one of the main items in the event’s agenda was very well delivered. He brought home all the convincing reasons why originals are worth it and why copies are a shame. He lead in to the discussion of Original vs. Fake by asking the audience a very valid question: how they would feel if someone plagiarized their work. Some bloggers shared their own experiences of having their work copycatted. The examples he gave of spurious and original phones that look almost identical, quality branded shoes and fake replicas were very apt. He went on to explain the effort , time and resources that go into creating an original product and how spurious copycats give them a bad name by cheating the customer. One of the important questions he started the session with was “why people choose fake products”. The answer? Because they are cheap and appear affordable. You may as well ask me why not add some cheap quality food color to that pure milk sweet I made. Go ahead. Ask me why not risk food poisoning. Why not draw it out into a long process involving a visit or two to the doctor, incur hefty doctor’s fees and goon medication while weakening the immune system as a special bonus. Not to mention the loss of income for the time off for Bloggers like me. How would you feel if someone paid you in counterfeit money for your hard work? So why choose an original product? Why boycott fakes and duplicates? The opposite of the above. Humph! Imagine buying fake medicines because the original was perceived as expensive. Imagine scrimping on buying original branded cookware, only to find that the few rupees you saved were for naught, because the cheaper copy’s coating came off after a couple of uses! Imagine replacing a minor part in your computer with a fake replica only to have your entire equipment crash and cost you thousands in replacement – not to mention the time lost and opportunity cost! Why, try posting duplicate content on your blog and get one tight slap by Google! How is HP, a global brand, encouraging the use of original HP products? By making their consumables as affordable as the fake copy – when the original costs the same, why would you risk buying a copy? I was very interested to know that HP has sliced their cartridge prices from Rs.800 to Rs.449. I am guilty of once succumbing to the temptation of refilling an HP cartridge for our office printer and almost screwing up a fantastic HP printer that produced original copies. Luckily we could chuck the cartridges almost immediately but whined about spending a hefty amount on the brand new cartridges. 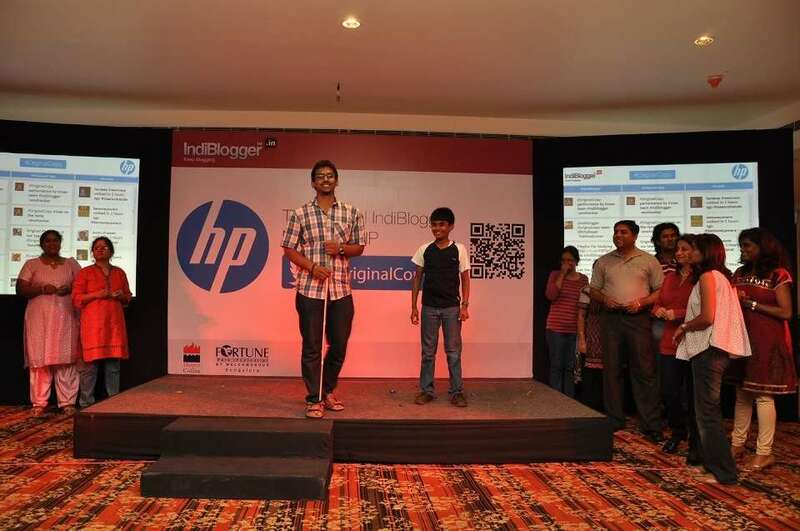 It was a terrific suggestion by IndiBlogger and HP to invite the bloggers to spread an awareness of why buy original, why not fake. We broke for high tea – I must admit I was rather hungry by then since I had skipped lunch. The veg menu was appetizing with veg spring rolls, samosas, two types of sandwiches and gulab jamuns. We also took in a quick photo shoot which….you guessed it….had prizes. Skits by mime by blogger teams. We made teams of 15 bloggers each and were given a slip of paper with the name of a movie on it. We had to mime as a group while the rest of the audience guessed the name of the movie. Oh, what fun it was! Nobody guessed what the ‘eck we were up to, on stage. A memorable moment for me was meeting Freya, an absolutely lively person. After the last team did their skit, Narnia’s Chronicles walked away with the first prize. Then, Anoop called all the “Project Managers” on stage to ask them why their group was the worst. Maybe the best answer would win a prize? Oh yes, our group, Kisses, did. Each of us received an 8GB USB drive and a book. Yippee or what? And? As we were busy trying to make sense, the official tweeters of our group were busy tweeting as there was a prize for that, too! Then Siddesh Ravan Kabe asked the group for question suggestions and invited bloggers on stage to pick one and answer it – for one minute. Siddharth, Rachna’s son simply stole the show. 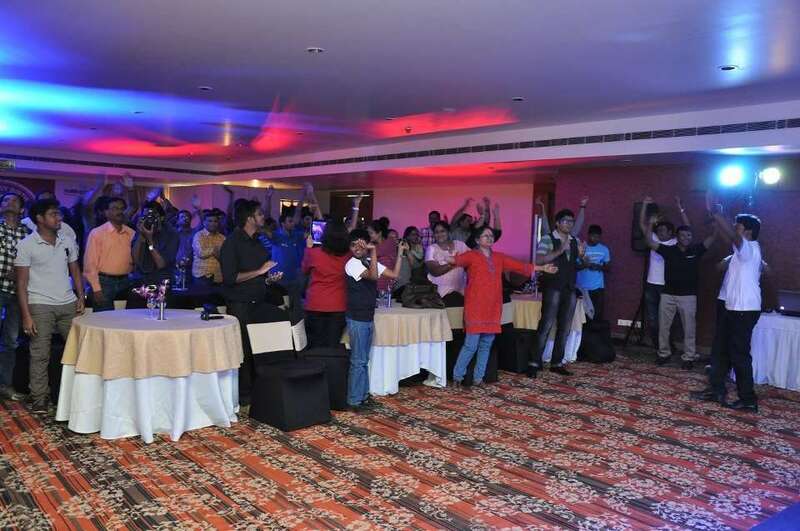 Participants won an Indiblogger mug each! Siddharth also won a printer for the best participation and I was so thrilled with that! As the afternoon wound down, we had a group photo session. Anoop then announced that all those who did not win anything could collect a book or USB. How generous! We also received a T-shirt each to commemorate the event. By the end of the day, there were random prizes for all sorts of hilarious things such as blogger with the least hair, a blogger table where no one wore stripes, a blogger with a persistent cough who made it to the meet, the most original answer to the question “Why this Kolaveri, Di?”…and so on. Talk about an original event! 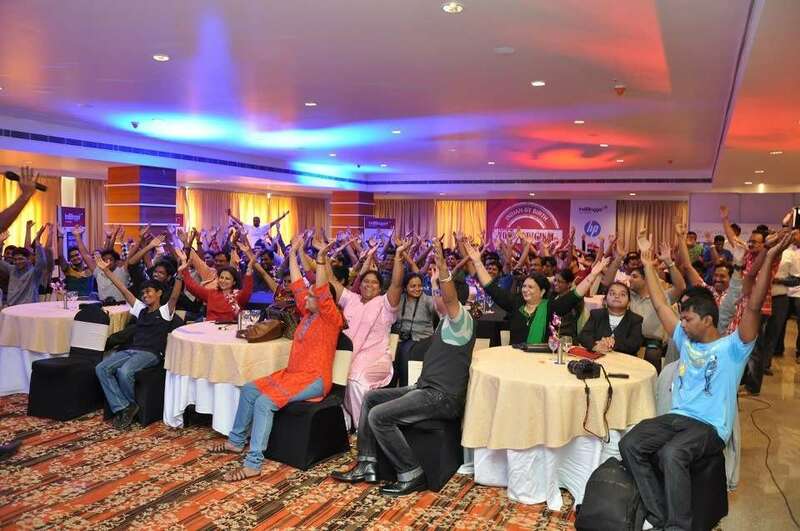 I appreciate the enthusiasm and commitment of the IndiBlogger team in making sure that everyone had a good time. As far as the winning goes, I think just attending these meets is a win-win for all. I love the camaraderie that exists. I love that everyone is prepared to let their hair down and have a good time. I am thrilled that my friend Rachna ‘s amazing son, Siddharth, a ten year old blogger who also attended the event clicked this photo: it currently adorns my Facebook profile page right now. What can I say? 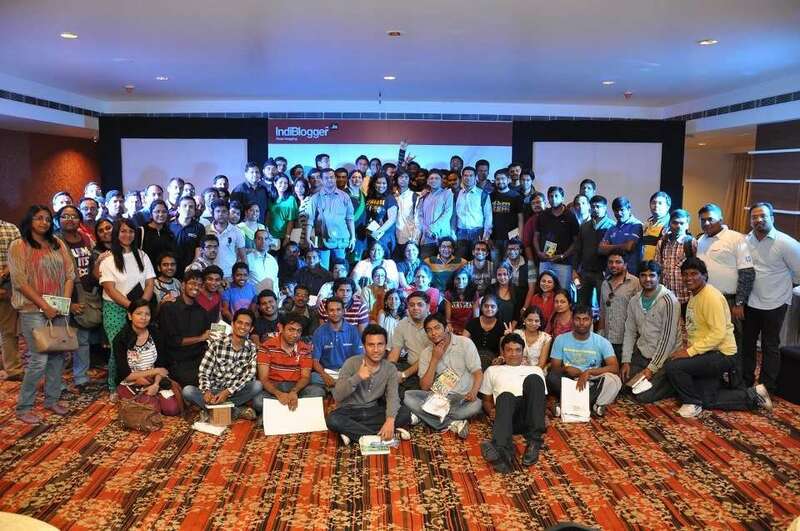 I am proud to be an IndiBlogger! Harper Collins was conspicuous by its presence via the books that were given out to winners and participants. I noticed that a book by Thích Nhất Hạnh was one of the books and wished I could exchange one of my books for that. Sadly, by the time I reached Vineet, there were none left. Then, Rajesh, who very kindly dropped me back home gave me his copy in exchange for my book. Was I happy? Silly question. Yes. Yes. I also collected a large print of our group photo. It was finally time for Goodbyes – nay – au revoirs! I returned home after a memorable Sunday afternoon with friends – old and new. 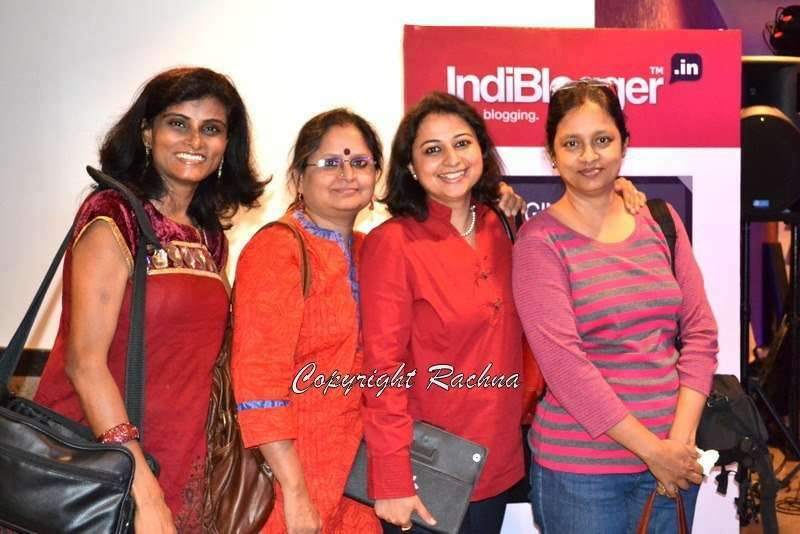 Pictures of the meet – courtesy IndiBlogger Team – more here. My hubby is a STRONG proponent of “you get what you pay for.” He never even bothers to look for his brand item on sale. I certainly hope MY blog is an original – – – I certainly haven’t seen any others out there quite like it. Once, and only once that I’m aware of, a blogger copied one of my posts and reposted it on her blog. When I saw it, I did a very startled double take because there was no credit given to me other than to mention she hadn’t written the post. I left her a comment and asked her to please take it down and instead leave a link to the post on my blog so that people could come to MY place to see it. She was very kind and very quickly complied. Other than that – – – no one has been wanting to plagiarize me. Finding your work plagiarized must have been shocking – and am so glad she was nice about it! I’ve heard some pretty nasty instances of copying content that became worse after the copycat was pulled up! I had the same experience with my health blog content – but sadly I could never get hold of the person – no contact info. I could have taken the domain registrar route, but I just let it be. You, my dear Keetha, are one of the most original people I know. I lurrrrv coming over to your beautiful place! Sounds like great fun Vidya. You do get what you pay for. Here when you have to buy a new ink cartige you can turn in the empty one and get 3 dollar credit for it. Does save a little money. Thanks for sharing your wonderful Sunday afternoon and enjoy those new friend. Dear Debbie, Yes I had a great time. We have that sort of initiative here, as well. And as far as I know, it is a good thing because I understand that they take care of these as e-waste – proper disposal rather than throwing it in the trash. The money saving is a bonus! Much love to you. Hugs! Yes, Julie! Thanks – and remember we have a date at the bakery! Hugs! P.S. Drat – I had to smile to honestly click the “Did you smile today” box – I’ve been so sick today and yesterday that I don’t think I’ve smiled once – until now. Lori Gosselin recently posted…What Do You Say to Someone Who is Grieving? He’s the smartest little guy and makes these blogger meets so much more fun. And consistently walks away with the youngest blogger prize! And his Mom, Rachna is of course, a terrific person! Yes, these meets are totally fun! Love to you! The original well organized post from you Vidya. You have unmatched skill in putting it in order and giving out every detail of the event. Great blog post from you once again! Thank you, Farida! I was in a rush to write it because we went out and the deadline seemed comfortably far away. And then, I barely made it :-)I kept having the feeling that I forgot something! Hmm. It is great meeting you at the Indiblogger meets, but seriously we should meet up outside it, because you know we barely get time to actually talk! Yes, indeed a great recap. I am seriously looking forward to a meet with you all. Hardly know each other on a personal level. Vidya you are our team leader, so looking forward to your call and initiative on this. Thank you, Indrani! Just waiting for me to walk normally 😀 then we’ll all meet up. Plus I have an incentive for you – the huge copy of our group photo! I’m with Lori–You know how to have fun! Are there any blogger conventions in the US that are that much fun. I bet not! Just guessing, though. I’ve never been to one. But your point about originals is well taken. And you, my dear, are the original original!! I second that Galen! And yeah, give me a local blogging party and I’m there! Galen, actually, the credit goes to Indiblogger for organizing this fun meet. I am glad I made it there – both the venue and the timing were just prefect. I usually don’t step out on Sundays except with family, but Indiblogger meets are an exception. It is like a mini-vacation to join them. Somehow, I always thought that there are more interactive meets in the US. As I was telling Lori, I dream of us all meeting up on day. My gut feeling says we will. Hugs! And thank you for the lovely words. Lovely recap, Vidya. The meet was such fun and with an important message! Loved meeting you. Rachna recently posted…Original vs. Fake! Ah, yes, Sandi! Macs are expensive. In fact, I had that moment a few months ago, but did not make the switch. So did you get your new comp? Hugs! Thank you for your kind words, Terri! It was great fun! You are awesome! And it sounds like it was a totally fantastic conference. KEep being your original self. Only one Vidya! Looking forward to meeting YOU, Pamela! Hugs! Thanks for sharing this in depth review Vidya – your story-telling ability gives us quite an insight into the event. LIke we were there too. The best part of these types of events is connecting in real life and realizing that there are real people behind the blogs. Did you see bloggers whom you read? Are they the same in person as their blogs:) ? Thanks Vishnu!Yes, I got to meet people whose blogs I read regularly! No, they’re not the same in person. They are much better than I anticipated 😀 Oh, it was such great fun – and I am looking forward to the next one! Great recap! I loved it for another reason too. Guess? I loved Sidharth’s participation and blog post! BTW, why doesn’t Vidur attend these meets too? He is a blogger too and would certainly enjoy them. Zephyr recently posted…Is ‘big fat’ a status symbol? 🙂 Zephyr, it was a lovely meet and unless I have an absolutely unavoidable reason, I would never like to miss one. I acknowledge the hug you sent via Rachna. I was going to get around to writing you an email…why, I still will! Another reason. Are you referring to the very nice picture on Vineet’s page? 🙂 Always such a pleasure to meet him. Of course I’ll keep trying! Sometimes there is no substitute for the original.